Cristiano Ronaldo was still in high spirits on Monday night as the Real Madrid star continued the celebrations after their Champions League triumph. 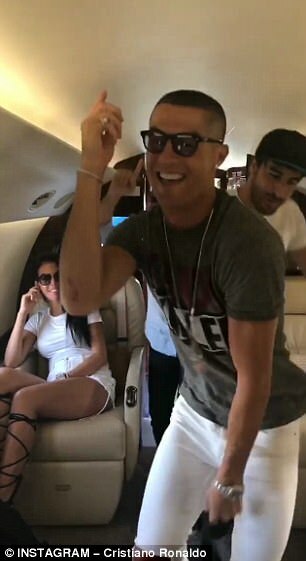 And the former Manchester United man posted a video on Instagram of him singing and dancing on a private jet with girlfriend Georgina Rodriguez and a pal. Ronaldo has also been showing off a bold new hairstyle. ‘It was a promise. I’d promised that, if we won the Champions League and I scored a goal, I’d do it. I did it and I shaved myself,’ he told Real Madrid TV.